On Family Day we attended the Old Navy Family Fun Day Festival (say that five times fast) at Old Navy, Rideau Centre (thank you Loukia for the invitation!). There was all kinds of fun going on during that event — from crafts to drawing art to dancing. And my Sweet Girl loves to dance. We host regular dance-a-thons Chez Gallant because we are a family that likes to boogie-woogie. But Sweet Girl is a shy girl and while she loves to dance, she gets intimidated by crowds (who doesn’t, really?). 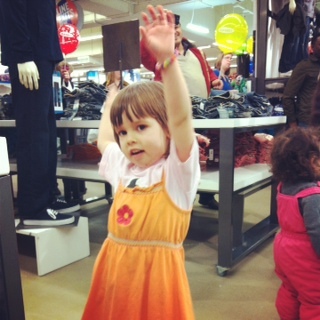 So for the first little bit of the dance party fun at Old Navy, Sweet Girl danced in my arms. With her head tucked in my shoulder. There were a tons of kids who were out on the dance floor with Sweet Girl and a huge crowd of people watching the kids learn new dance moves. It was hilarious, cute and a great time. I have tons of video footage but you don’t want to see minutes and minutes of my girl dancing. And frankly, I’m not that good of a video editor to make it even tolerably interesting for you. It took me 2.5 hours to get 15-seconds of video worth your watching time. At least I hope it was worth it. Please tell me it was worth it otherwise I may cry. And while the time it took to deliver that final, ah-mazingly edited video to you can be attributed to a learning curve, video still requires a time investment I’m not sure I’m committed to giving. I’ll stick to publishing photos for the most part. Do you use video as part of your blogging strategy? What tools do you use to make it easier? For the record, I used iMovie to create the above. She is beautiful and she is getting so big ! I’d probably get better at it the more I create and edit videos but not sure I’m passionate enough about video to put the effort in.